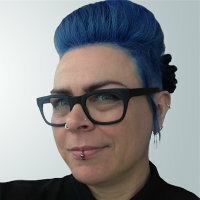 Tracey is studying towards a PhD in Human-Computer Interaction, researching the challenges encountered by end users when developing physical computing devices with platforms such as Arduino, with a view to finding ways to support them, particularly in troubleshooting. Her supervisors are Dr Simone Stumpf, Dr Sara Jones and Dr Jon Bird. She joined the Centre for HCI Design (HCID) in October 2012, after completing a MSc in Human-Centred Systems (awarded with Distinction) at City, University of London. Her MSc dissertation investigated the potential benefits of visual (graphical) programming languages for end users programming Arduino. Immediately after her MSc Tracey worked as a Research Fellow on the award-wining EVA project, investigating the potential of multi-user virtual environments for improving the communication skills, and reducing social isolation, of people who have aphasia following a stroke. Through a co-design process involving 5 people who have moderate aphasia and researchers from both HCID and the Division of Language and Communication Science, Tracey developed EVA Park, a private virtual world for use in an experimental trial. Before joining City, University of London, Tracey spent a decade working on technology projects in the Voluntary Sector. She is also a City Interaction Lab Associate User Experience Consultant. Booth, T. (2015). Investigating the barriers experienced by adult end-user developers when physical prototyping. Booth, T. (2015). Making progress: Barriers to success in end-user developers' physical prototyping. Booth, T. and Stumpf, S. (2013). End-user experiences of visual and textual programming environments for Arduino.